My daughter Joëlle had the excellent idea that I should share her holidays and spend a fortnight in the Shetland islands last June, together with a friend of hers. It was simply beautiful, unexpectedly sunny and full of birds. Thus we have some photos to share. Joëlle’s ones are labelled (Jo). 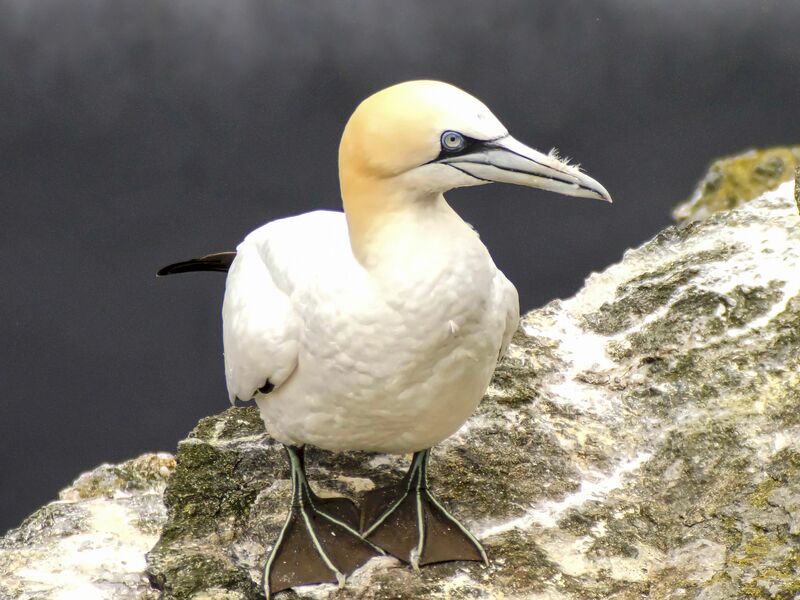 Honor to whom honor is due, we start today with the Northern Gannet (Morus bassanus, Sulidae), the larger nesting sea-bird you can see in Europe, with a wingspan up to 180 cm and a weight of about 3 kg. It is one of the rare species of sea birds that is expanding steadily from WW2 onwards. 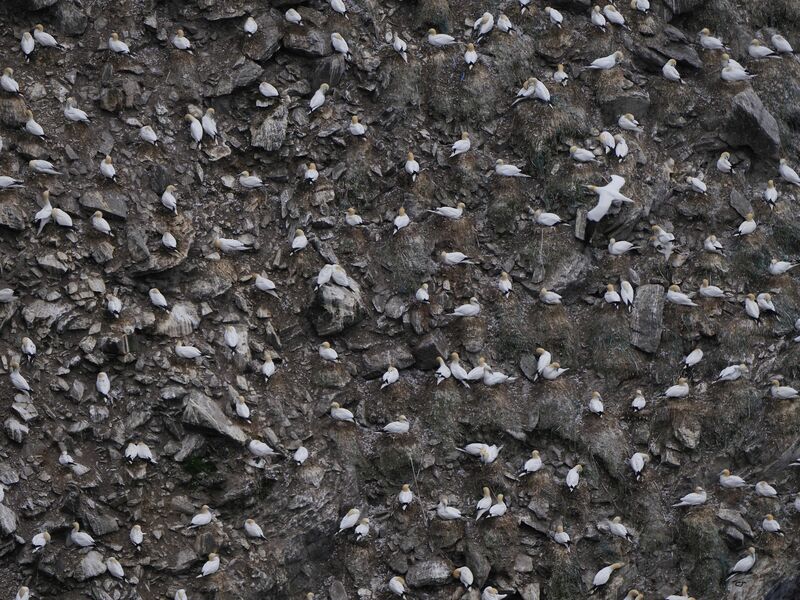 (Jo) A small part of the big gannet colony at Hermaness, Unst Island (more than 20’000 paars). To estimate the scale: the two small dots at the top of the cliff are the friend of my daughter, standing up, and myself, sitting and looking through my scope. Colony life. Many birds are just sleeping on their eggs or preening, but by enlarging the picture you can also see couples greeting, mutual grooming and even a copulation (right part of the photo, 4 o’clock under the flying bird). The relatively regular spacing of the nests is directly related to the extent of the beak’s reach of brooding individuals. Look at these feet! The ducks and the gulls have a three fingers web – the gannets, the cormorants and the pelicans have a web encompassing their four fingers. This one was vigorously scratching its chest just before I took the picture (ectoparasites? itching moult? ), hence the little feathers on its bill. 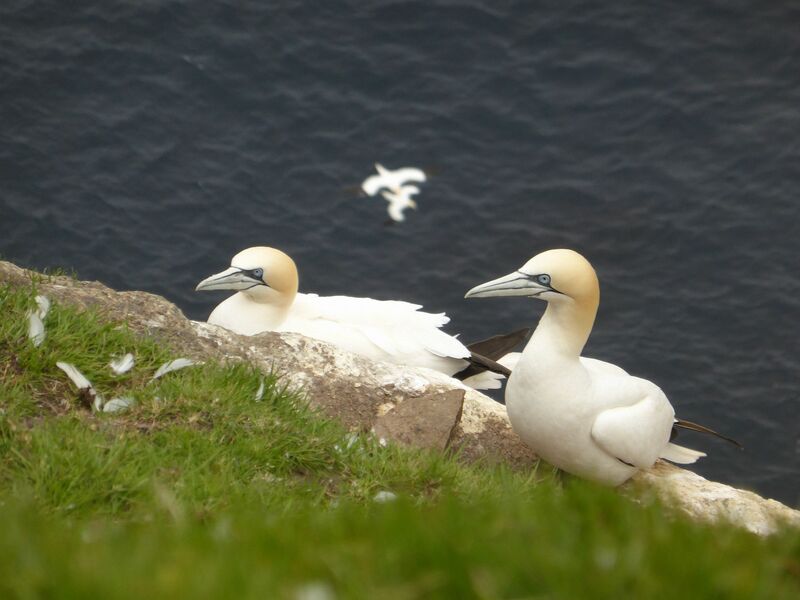 (Jo) Around the colony, on places unfit for nesting, e.g., in easy reach of rats and other terrestrial predators, young gannets gather in bachelors’ clubs. 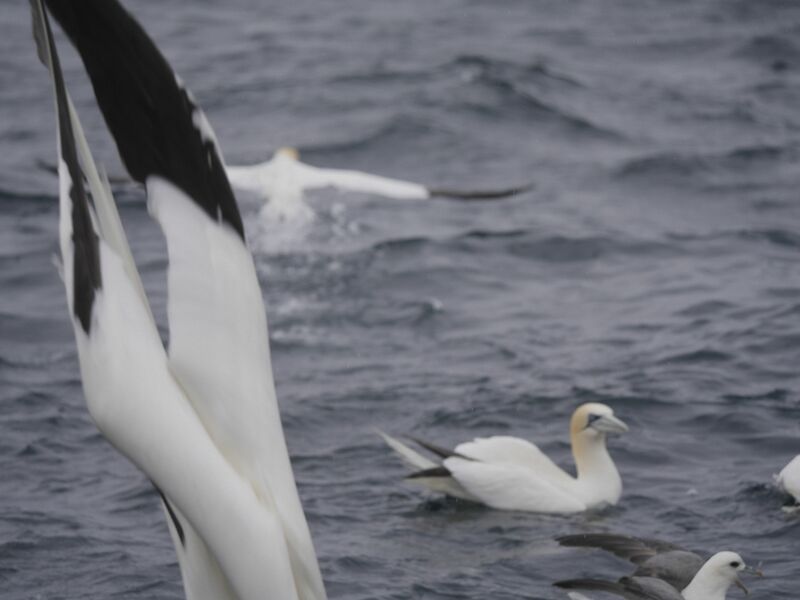 They have to wait at least five years to get a nesting place, either in the center of the colony if some old gannets don’t return, or on the periphery where the colony can be securely expanded. (Jo) … and they were right! It was a very lively moment. See the blackish feather on the tail of the bird down right? This remains of juvenile plumage indicates that the bird is about four years old. Gannets can live up to 35 years. A very bad and unexpected photo! 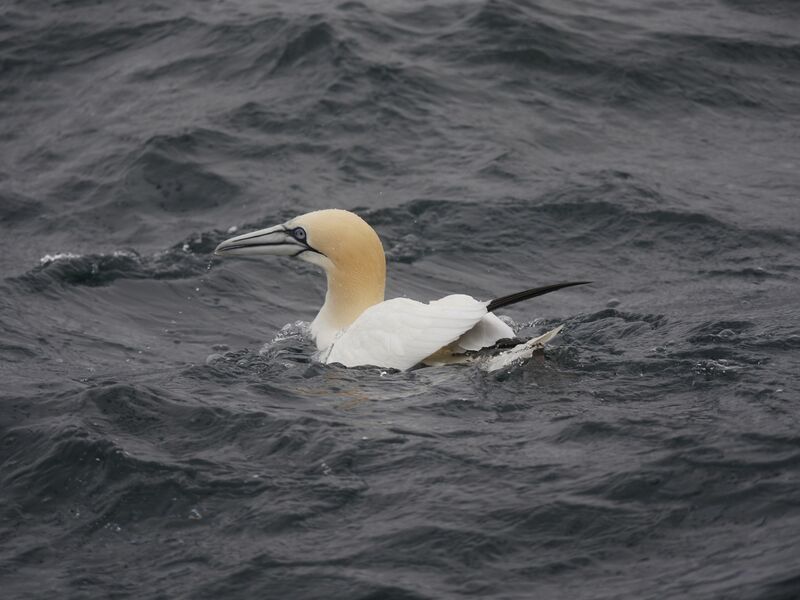 A gannet dived just in front of me, his wings completely thrown back. They plunge from 10 to 60 m above the sea and reach a deep of 12 m. Wikipedia shows a more orthodox picture of this behavior here. Resting at sea after a good meal. This entry was written by whyevolutionistrue and posted on July 18, 2018 at 8:00 am and filed under birds, photography. Bookmark the permalink. Follow any comments here with the RSS feed for this post. Both comments and trackbacks are currently closed. 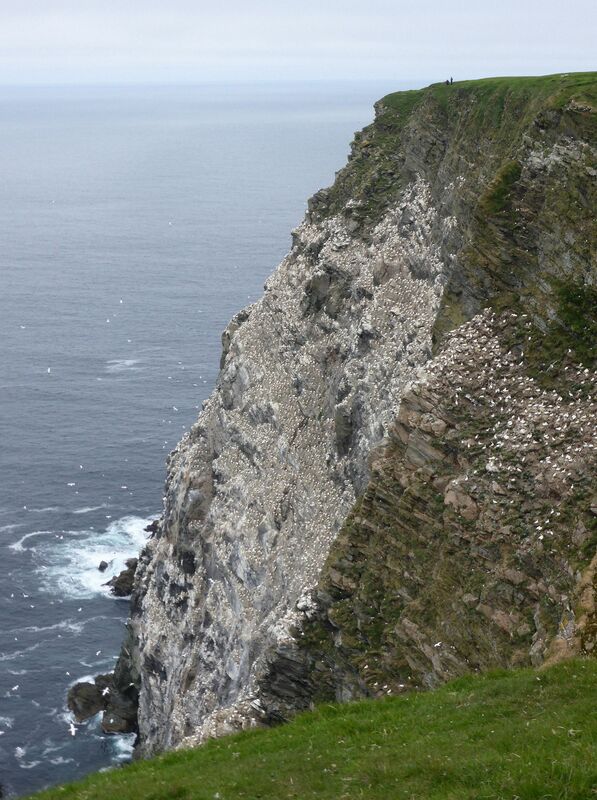 The cliff with all those gannets is quite a sight. Interesting colors around the eyes and on the webbed feet. Very nice photos! I actually kind of like the literal “photo-bomb”! On my first visit to Sandwood Bay, just south of Cape Wrath in Scotland, a huge flock of gannets was feeding just offshore. 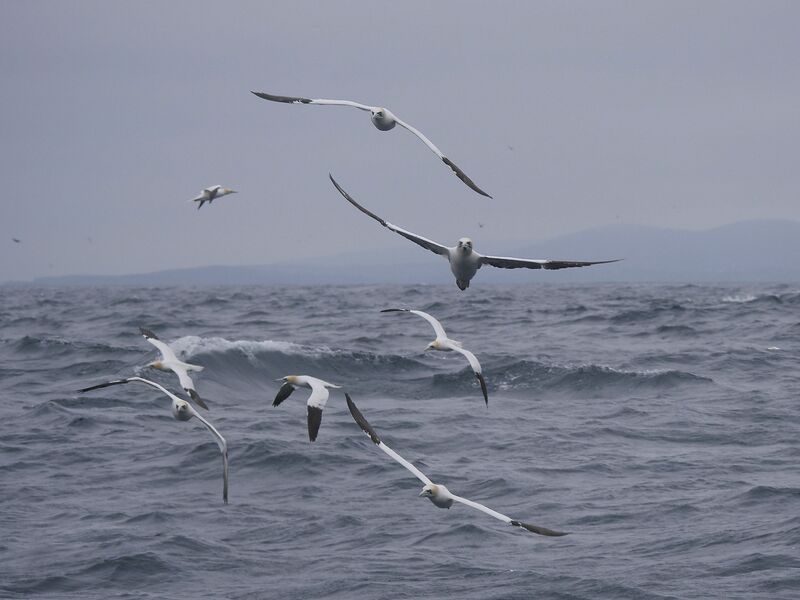 They are really spectacular birds, cruising until they see a fish, then initiating a startling dive with arrow-shaped wings, and surfacing a surprisingly long time later. Those large feet enable them to be powerful swimmers underwater. Thank you for your photographs, reminding me of a cherished memory from decades ago. Wow! Love the birds in that part of the world. The scenery too. Great pictures. 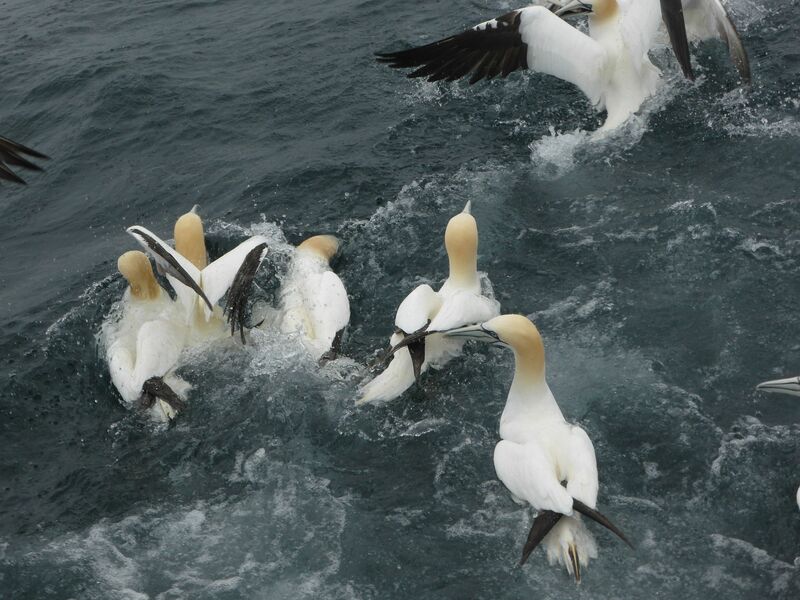 I have fond memories of visiting a gannet colony somewhere in eastern Canada about 70 years ago. More recently, we had distant views of large colonies and closer views of flyers while cruising the Scottish Islands a couple of years ago. They are very beautiful birds. I can almost smell the salt in the air. Lovely photos! Great photos. What a beautiful bird. The cliff shot almost made me dizzy. Very cool! The markings on gannets are quite lovely. Thanks for these. The color of a lightly toasted marshmallow.